Connor’s only two, but he’s big for his age. Healthy. Bumping and charging around Dr. Katie’s examination room like it’s play time. Terrific two. And he is healthy, except that he needs a new liver. Sooner rather than later. His blood type is O.
Dr. Katie lets Connor play, takes her time looking in his ears, listening to his heart; she slips her questions for Julia, his mother, into conversation. Dr. Katie’s the mother of three boys. She’s got this. The light of late summer makes Julia golden. She’s wearing a blue dress with a bib, an extra layer of fabric over her torso, front and back; her brown hair is pulled back under the white mesh of a covering. Behind her, out the window, is all black-eyed Susans, cropped grass, cornfields for acres. There are a lot of things Connor can’t eat. She tells us that this week, when nobody was looking, he took a forbidden bite out of a hunk of cheese. Teeth marks. We all giggle, Connor too. Julia and her husband, Daryl, had no idea they were both carriers for maple syrup urine disease, or MSUD—named for the way it makes urine smell, for the toxic acids it causes to build up in blood. A Mennonite disease, though others have it, too, just not as commonly. Julia tells us her life is on hold—Connor’s potty training, even, is on hold—until Connor gets a liver. Until they get a liver. Julia knows that the formula she gives her son twice a day helps keep him alive. All they need now is for the transplant center to call. Donna’s been at the clinic longer than anyone else. Twenty-one years. She’s a nurse practitioner, has a master’s degree from UPenn. Knows all the Amish and Mennonite children by name. She visits the palliative patients at their homes (the ones who can’t be cured), driving her minivan over winding roads until she finds them: the terminal microcephaly children born with stunted brains—some born dead, others living longer. The pigeon-breasted babies, their ligaments pulled so tight their rib cages jut forward. Donna’s not sweet. She’s not clinical, either. She’s frank, feeling, steady, practical. When she talks with mothers, her pragmatic relationship to hope and pain is clear. There are many quilts here, colored swirls, hours of tiny stitches, gifted to the clinic by patients’ families. The one behind Donna makes her glow pink. James asks if he can turn the florescent light out, open the blinds. She says yes and looks uncomfortable under our attention. He asks her about the pink quilt and she hops off the table, turning her back to us. “This family is Amish, this family Mennonite.” Stoltzfus, Martin, Horning, King. I look for my family name. In the hallway, two-year-old Connor shuffles and dances, playing with Yalonda, the receptionist. It’s a clinic for kids; no one cares about the noise, the dropped toys, the clamor. 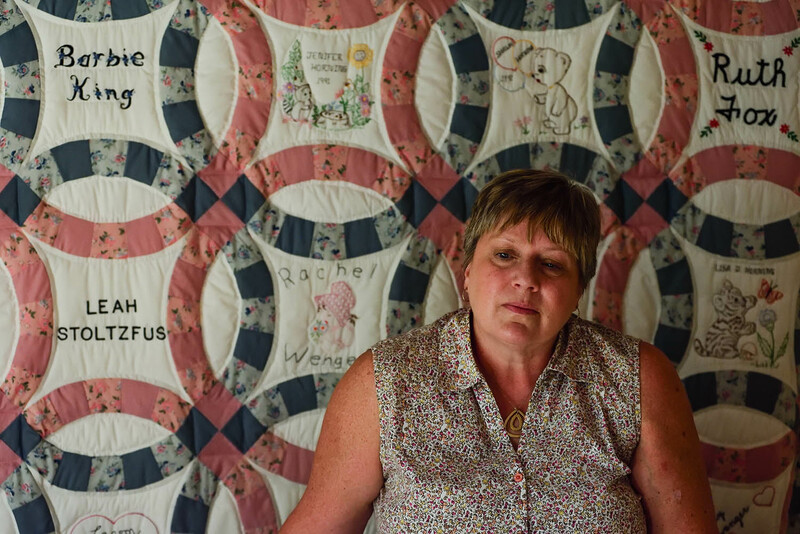 “She died last year,” Donna says, pointing to one intricately stitched panel. We make her start at the top and read the rows across, like a book. Like the history of the clinic, of her years here. She tells us where each patient is now, living or dead. Donna’s never been to this Amish home before. Their fifth child, the only girl, has pigeon breast syndrome. Three months old; terminal. A new tobacco barn stands on the hill above the house. Blonde vertical boards. Tobacco stalks, yellow and hanging, threaded on lath, show through the barn’s open slats. My home is only a few miles away. I think of the barn raisings I’ve seen as a kid. Donna comes back out to say we can come in, but no photos. The Amish shun cameras, the vanity of a captured likeness. Four boys, two of them twins, are playing in a sandbox under a tree. They gawk at us, big blue eyes, blonde bowl cuts. The brittle brims have worn off their straw hats, straw fezes. A laundry hoop hangs above them, no clothes, but a clutter of pins. Like the flies on the sticky yellow strips that span the kitchen. Inside, Donna picks up Suzie, the baby, as Mother watches. Mother is barefoot, like all the kids. Her front teeth a little buck, her talk sing songy. Her dress dark blue, handmade. The sewing machine, an ancient Singer, foot pedal, sits against a wall in the living room. Mother says sorry for her bad English and Donna says sorry for her bad Dutch. Then Donna hands Suzie to me, a little package, quiet and still. Dark hair, lavender dress. Almost perfect. She smells like sour milk. Donna listens to her heart, touches her belly. Talks calmly about what to expect. Father comes in and stands in the kitchen doorway, his big hands black from picking tomatoes. His big feet black. His wife is taller than he is. He asks Donna if they should vaccinate Suzie, if she should have flu shots. I look at Donna; most Amish don’t vaccinate, don’t get flu shots. But faith has limits. It might prevent illness, infection, a cold, Donna says. Suzie in my arms is too still. The brown dots are blood. Blood can be mailed if it’s dry, he tells us. Of course it can. I’m mesmerized by all this blood. New blood, dry, well traveled, full of stories. The cards have names on them, the box is a sampler of handwriting, personal information and DNA. One box is only numbers. 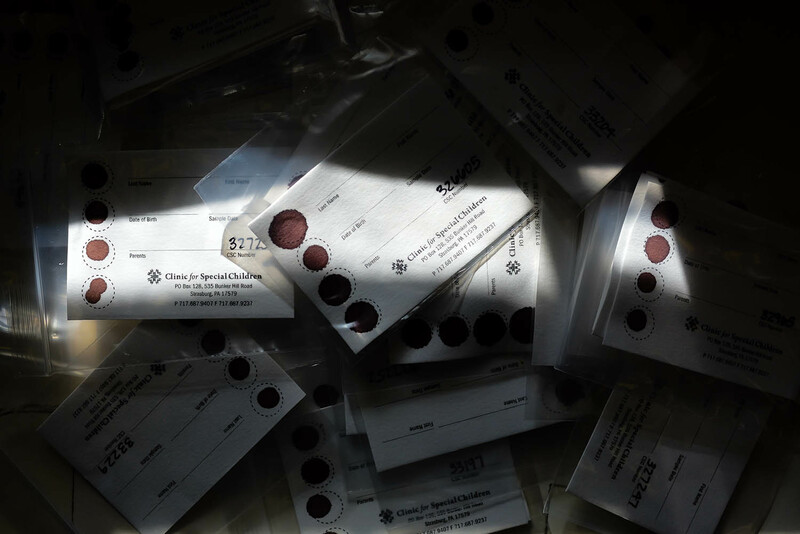 At the clinic, blood samples are taken from patients and tested, the genome mapped, the exome sequenced. “Novel” diseases, as they’re called, are identified. Lives saved—or at least understood. Outside are cornfields, cows, buggies, luddites. All the pastoral tales about the technological aversion of the Amish fall away. An anomaly, outed by a high amino acid count, can be traced back generations—eighty original Amish, 240 original Mennonites—and projected onto babies. The data predicts a patient’s future, determines their treatment and changes their fate. For $75 Anabaptists from all over the state can send in their brown spotted cards and learn things that God has kept mum on. Will their baby live? What does blurred speech, wobbling like a drunk, mean? Seizures? Slanted eyes? An extra finger? Delayed development? 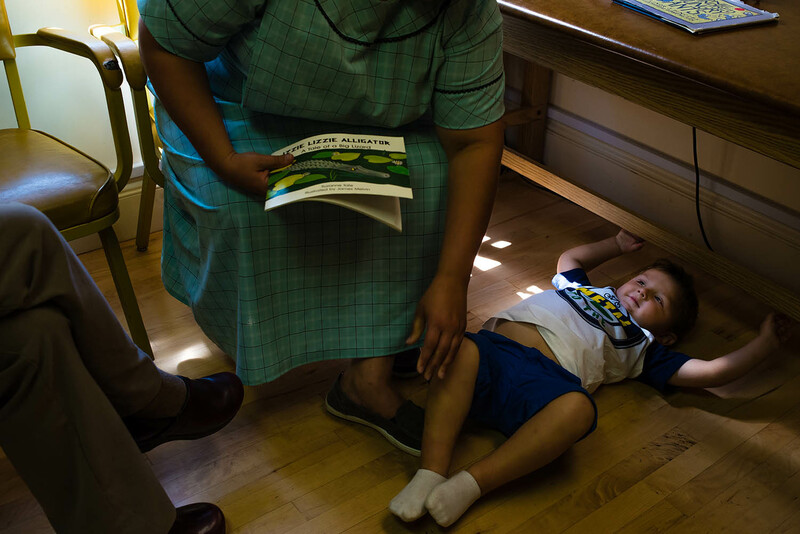 “What is Wrong With Our Baby?”—the title of a blue book in the clinic’s reception room. Donated machines keep the costs low; donations, auctions, fund-raisers, discounted fees for visits. The clinic is sustained by patients’ families. It looks and feels holistic—pure, advanced, sustainable. Erik’s office is in the basement, small and low. Two windows frame bucolic fields, soon ripe, poplar and oak trees. Genealogy books stuff the shelf, the families of the founders listed, dated, a web of genetic material, acreage, marriage, birth, and death. Papers, journals, and reports fill the far corner of the room like fall leaves. Erik’s description of the clinic’s work is sequential, methodical, rapturous. The tangible life of the staff and community is upstairs in examination rooms; down here is the clinic’s brain. “The diseases we see are not caused by close marriage,” Eric says. Anabaptists are not inbred, a pejorative term: siblings behind the barn, insults on the school yard, revels in taboo. ‘Consanguineous’ is the geneticists’ term. “Any union is consanguineous if you can document the genealogical relationship,” Erik says. These “novel diseases” are not punishment for unnatural insularity. Another tale of plain people, dispelled. In the late 1600s, early 1700s, 320 Anabaptists plunked down on the material out of which a country is being made. Ten or eleven or twelve generations of taking care of their own, marrying their own, makes for uniform genes. 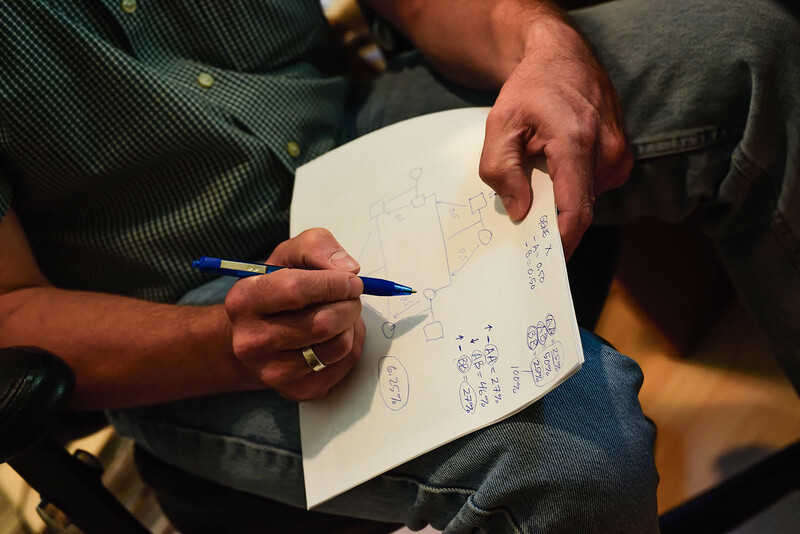 Unlike the general population, their entire history is mappable, contained genealogy. Anomalies stand out, like historic details. Little mutation flags. They’re easier to find among the Anabaptists; Erik knows what to look for now. He reads them like words. Blue ink on paper on a knee. Mothers are circles. Father’s are squares. Lines point to children, grandchildren. Who is a carrier? The genome meets the hope for a healthy baby, a perfect little hand on your face. What Erik knows, what the clinic does, is bigger than Lancaster, PA. It reaches Indian babies, Chinese babies, a baby named Sabrina. A small set of European genes, once removed, with lessons for all genetic research. Like a map key, barefoot and earnest. His job is to be the auctioneer’s eyes. He watches a section of the standing crowd for a raised white card with a black number on it, a bid. We don’t ask for his name; he’s busy. He yells and points when he sees a raised card, the auctioneer shifts his numerical rap to a higher number. Quilts in every color, tools old and new, handmade desks smelling of fresh varnish. Tomato plants, zinnias, all for sale. All proceeds go to the clinic, their special children. The shade of the roof is high and echoing. Thousands mill around in their good clothes. The day is clear and bright, not too hot. Celebratory. The kids cluster by gender and age. Unmarried girls with long braids, boys with big hands and feet. 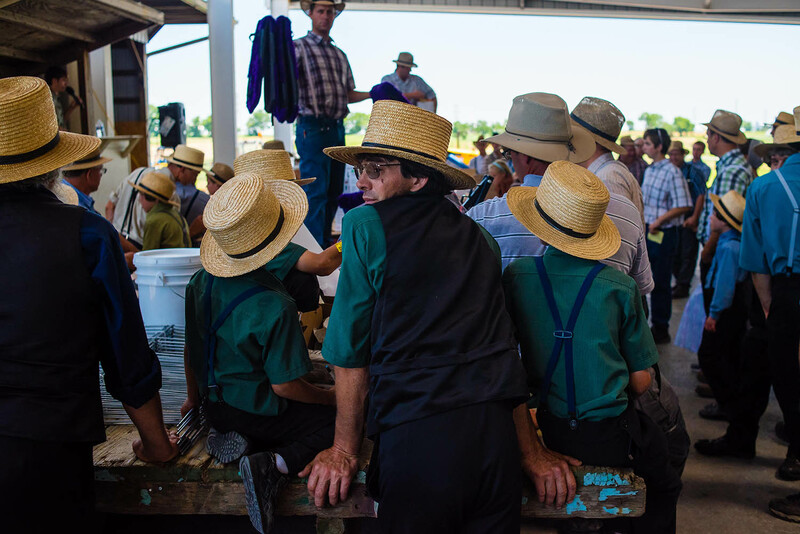 The adults are a picture book, their clothes display every Anabaptist sect: black-stringed Mennonites, Brethren, bibbed dresses, suspenders with crossed backs, straw hats. Straight-pin Amish, button Amish. Anabaptists, the clinic’s patients, host five auctions a year; the money raised makes up almost 30 percent of the clinic’s budget. This auction will raise hundreds of thousands of dollars; the attendees, the clinic staff—are all proud, and a little amazed. Community works. Local health care works. Amish and many Mennonites don’t have insurance. It’s theological; when your history, your belief, is shaped by a marauding government that slaughtered—martyred—your ancestors, chasing your founders across the ocean on ships (what are ships to farmers? ), you foster separateness. You know there are no absolutes; you vote sometimes, you avoid the military, you pay some taxes. Still, you’d prefer to take care of your own. At the end of the day, when the auctioneers run out of things to sell, the food sellers bring what they have left. Pulled pork sandwiches, cans of coke in coolers dripping with melted ice, whoopie pies—brown and white in cellophane. The barking auctioneers sell off every last bite. Reporting for this project was funded by the Economic Hardship Reporting Project. Ann Neumann is the author of The Good Death: An Exploration of Dying in America (Beacon, 2016). James Sprankle is a photojournalist who has documented conflict and crisis in East Ukraine, South Sudan, and Greece and has worked with publications such as Politico Magazine, the Washington Post, Foreign Policy Magazine, and National Geographic Online.